The Obama administration is examining ways to pull foreclosed properties off the market and rent them to help stabilize the housing market, according to people familiar with the matter. While the plans may not advance beyond the concept phase, they are under serious consideration by senior administration officials because rents are rising even as home prices in many hard-hit markets continue to fall due to high foreclosure levels. Trimming the glut of unsold foreclosed homes on the market is "worth looking at," said Federal Reserve Chairman Ben Bernanke in testimony to Congress last week. Nationally, home prices in May were 7.4% lower than a year earlier, but after excluding distressed sales, prices fell just 0.4%, according to CoreLogic Inc. Foreclosures and other distressed sales now account for about 30% of homes sold each month and sales from government-related entities make up about one third of that number. Renting out homes could cover the costs of holding the properties until they can be resold once markets stabilize, potentially turning a profit for mortgage titans Fannie Mae and Freddie Mac or the Department of Housing and Urban Development, which handles foreclosures on loans backed by the Federal Housing Administration. Analysts at Credit Suisse estimate that reducing Fannie and Freddie's foreclosed-property sales to around 30,000 each month, from the current rate of 50,000, would cut total distressed sales by one third and avoid a further 3% to 5% decline in home prices. 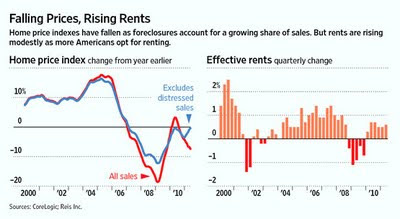 By flushing foreclosed properties onto markets with few traditional buyers, Fannie and Freddie are "undermining their own recovery," says John Burns, the head of a homebuilding consulting firm in Irvine, Calif., who backs the public-private rental approach. Bank-owned properties are "concentrated in certain places where lower prices are not going to get more demand," says Kenneth Rosen, chairman of the Fisher Center for Real Estate Research at the University of California at Berkeley. Simply liquidating homes at "auction prices" will drop values for all homes by another 10% to 20%, he says, pushing more homeowners underwater. Fannie and Freddie, which were taken over by the U.S. three years ago, currently rent a few thousand homes to former owners and tenants. Two years ago, investors began scooping up cheap properties at auctions in the hopes of reselling them for a profit. But with home values declining, "flipping is tough to do," says Eric Peterson, a former homebuilder and co-founder of Praxis Capital of Santa Rosa, Calif., which has launched a $10 million fund focused on renting out foreclosures. Meanwhile, as more Americans go through foreclosure, the number of households opting for single-family rentals over the past five years has grown at about five times the pace of that for overall shelter , according to research firm Zelman & Associates.